Share the post "Album review: W.E.T. 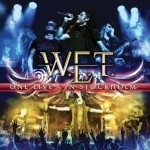 – Live In Stockholm"
The nearest to a supergroup in the current melodic rock world, W.E.T. have within a short space of time become one of the darlings of the genre. So hot on the heels of last year’s excellent Rise Up album, it is perhaps forgivable that, only two albums in, they have resorted to the old double live album trick that in the old days bands only released after a substantial studio body of work. This show was recorded just before Rise Up’s release before an invited fan audience and was described by singer Jeff Scott Soto as their debut show, even if many of us were there at their actual debut at Firefest in 2011. This album is effectively the complete works with all the best songs from both albums, ranging from brash anthems such as Walk Away, Invincible and Rise Up and big ballads Love Heals and Comes Down Like Rain dedicated to Jeff’s late Talisman colleague Marcel Jacob. They sound reasonably similar to the recorded versions, albeit with the Eclipse pair of Magnus Henriksen and , providing added twin guitar crunch. Each of the parent bands that make up W.E.T.’s initials were also represented in the set: The Great Fall from Robert Sall’s Work of Art, whose lead singer Lars Safsund guests, Bleed and Scream from Eclipse, and Jeff reprising his Talisman classics I’ll be Waiting and Mysterious. The effect is to almost make this set a greatest hits of Scandi melodic rock. An incredible value package is even topped off by two new songs, Poison (Numbing The Pain) and the power ballad Bigger Than Both Of Us, although i suspect these are ones that did not make the cut for the studio albums. This entry was posted in ALBUM REVIEWS, ALBUM REVIEWS (Mobile), All Posts and tagged album, Eclipse, Erik Martensson, Jeff Scott Soto, Live In Stockholm, review, Robert Sall, Talisman, W.E.T., Work Of Art. Bookmark the permalink.